So, China will buy some soybeans from the US, which it was likely to do anyway, since not all Chinese demand could be satisfied by Argentina and Brazil. Maybe it’s the realization that the concessions aren’t that big that shows up on Mr. Trump’s face. Source: Jonathan Ernst/Reuters in Wiseman et al./AP. This entry was posted on December 1, 2018 by Menzie Chinn. More concessions may have been agreed upon privately. So, China doesn’t “lose face.” Normally, trade disputes are less public. Trump can always raise tariffs if China doesn’t make satisfactory progress. we have the greatest trade pact in history, according to trump, but its important details must remain secret. great. “More concessions may have been agreed upon privately. ” and your evidence for this is what? “More concessions may have been agreed upon privately.” You know this? How? Is Wilbur Ross giving you inside information? We know he is corrupt enough to trade stocks on it. Are you trading stocks using information information? Hey Peaky – the SEC is contacting the FBI to have you thrown in jail! Also from your Google research. Ahem another blatant lie. The increase in tariff revenues is nowhere near what Trump tweeted. Line 6 is called “customs duties” (aka tariff revenues). We never collected a lot before as this averaged only $38 billion over the 2016-2017 period. Sure tariff revenues will be a bit higher for 2017 but then we impose tariffs on a lot of goods from a lot of places. Yet Peaky provides us a discussion where Trump touted how much in new tariffs we are collecting from one nation alone. Trump is not only a liar – his lies are really stupid. I guess that is why Peaky likes this clown. Perhaps both realise the long term implications of a trade war. But at least Trump got to put his brand on NAFTA 1.1. Trump acts like the big bully until someone stands up to him and then he goes crying to mommy! Don’t forget this administration played havoc with agricultural supply chains for two years that may reorder how China buys soybeans. Also that article from Russian state media (RT) may be an indication of how Russia views all this. 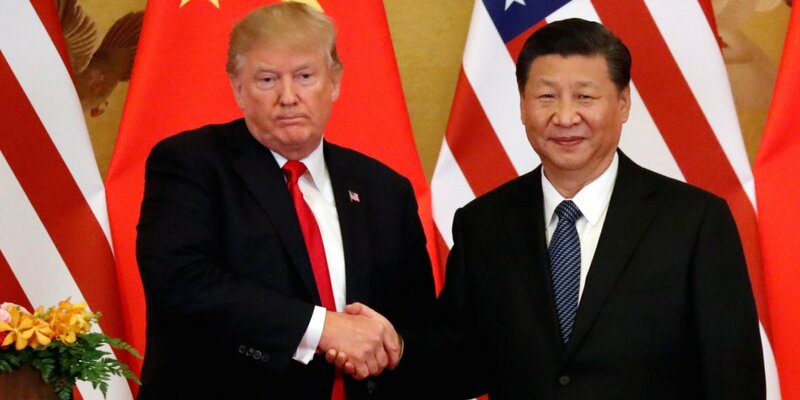 “”President Trump and President Xi have agreed to immediately begin negotiations on structural changes with respect to forced technology transfer, intellectual property protection, non-tariff barriers, cyber intrusions and cyber theft, services and agriculture,” the White House said in a statement. I don’t think you understood what Samuel wrote. Structural change here means the Russians replace us as soybean suppliers. Of course Putin compensates Wilbur Ross with some secret side payment. Hey Peaky – what is your cut in this corruption? You are exactly right PGL. The changes being forced in agricultural supply changes by all of this administration’s nonsense are real and not all seem to the benefit of the U.S. farmer. Also, soybean prices are getting a boost this morning but, despite what the White House statement said, China has not said they lifting their 25% tariff on soybeans. Regardless, if you are soybean farmer, you may want to take advantage this morning because prices are approaching the yearly high. And, at $9/bushel could be profitable to some, especially with a govt subsidy check. I bet CoRev is re-running his elaborate Excel models on this information. I just hope none of these farmers expect CoRev to get the modeling right. Sorry, I meant to say “agricultural supply chain” rather than “changes.” Also, I wonder if PeakTrader is a trader in ag commodities. If so, the volatility in markets may be a good thing for him. For farmers/producers and the decisions they have to make, not so much. Thanks for your comments. Both sides could use a temporary truce: US to see how US economy pan out over next three months. For trump, a required condition for winning is a robust US economy; for China, more time for better preparations and conditions to improve for holding on position or negotiating a mutual agreement. Hmmm. Well, Trump announced that we no longer needed to fear North Korean nukes and that negotiations on getting rid of those would start after he met with Kim Jong Un. So fssr, no negotiations and the North Koreans are apparently continuing to build nukes. Then we had his meeting with EU’s Juncker. This one also involved Trump promising not to follow through on a threat to further raise tariffs. EU lwas to buy soybens and trade negotiations would commence, or ee-commence given that Trump shut down ones that Obma had started. Price of soybeans has barely moved, whatever those Europeans did, and negotiattions have not started yet and may not at all. This is the track record. Do not expect much of anyrthing out of this agreement aside from the photo op. Can we pull out the magic decoder ring and write this in plain English? Gee Starbucks China will turn over those franchisee fees which are 6% of sales to the US parent. And McDonald’s China will turn over its 5% of sales franchisee fees. After all – this is US created IP – right? Oh wait both affiliates have been doing so already for many years. In other words, this is much ado about nothing. And there was no IP theft even years before Trump. Of course PeakParrot will keep saying “IP theft” along with “polly wants a cracker” as he has no clue what he means by IP theft. I just hope he knows what a cracker is! Menzie, I was mainly trying to digest the prior guest post, as the reading is slightly thicker than average, so I wanted to make sure I took it all in before commenting. But as relates this post, I had a question that strongly relates. I was listening to BBC radio in the late am hours yesterday, they have a show called “The Compass”. And on this show they talked about a woman named Jennifer HIllman who is a Georgetown professor who has lots of ideas on this, and they seemed to think she had quite a unique tact on this that was different than trump’s and might be much more pragmatic in changing some of China’s behaviors (prior to the friction with donald trump). Now I have just barely scratched the surface of Jennifer Hillman’s writing and strategic “tact” on this as relates China and the WTO. But I know you keep your ear close to the ground and read volumes on this, so I figured you had read Hillman’s thoughts and whether you thought Jennifer HIllman “had the right idea” on it, as directly relates to China and the WTO?? Also, the thought had occurred to me Hillman might be a great “guest columnist” for Econbrowser in a “one off” or whatever. If you could give me a short reply on this to get an abbreviated “feel” for you opinion on Hillman’s “tact” I would be eager and grateful to hear that. Patrick R. Sullivan was still babblng his LuskinLite free markets are great nonsense as late as spring of 2016? Lord – he never got a single comment on his old blog. But I do see a couple of his worthless posts got a comment. Both times it was some crazed woman going on and on about how her lover left her. Damn the internet is a weird thing! Casey Kasem! Now that is a throw back! Couldn’t resist to rib you. Showing my age again?? Yeah, I remember listening to Casey’s Top 40 show as a little boy when I lived in very rural Kansas. It was fun listening on the weekend back then. Now it seems cornball as hell, so kinda humorous to pull out those old things on Youtube. I’ll give you some good material to use this against me in future blog wars. My two favorite songs back then were “Pac Man Fever” and Rick James’ “Super Freak”. I’m glad there are no existing tapes of the scene. Seeing a roughly 8 year old kid dance alone (white dude dancing) to “Super Freak” in his room is quite frightening. And if video did exist I feel quite certain they would make excellent blackmail material. Never mind music tastes that border on a felony crime. In fact “Pac Man Fever” is like a double homicide. A crime against music AND a crime against a pretty good video game of its day. Anyone have a rope and a sturdy but lightweight chair handy?? Menzie doesn’t put too many of these photos up on the blog, so you know when he grabs one to upload it’s apt to be priceless—this one qualifies. I have said many times before I spent extended time in China, and have very much a “love/hate” feeling to it. But I gotta say, I love this photo. Wonder if I printed it out and laminated it if it would look silly framed and hung on my bedroom wall?? Hell, I’d probably put it up in my window facing the exterior of our house, but I’m afraid the local Okie rednecks would throw a rock at it. Now, I know all of these things are easy to say after the fact but I have always thought of this guy as a tremendous prick. Similar to Charlie Rose in his latter years, just some kind of “ick” vibe floating off him. Now I wanna know, he is below average looks (whatever that judgement means coming from a straight male) and he has a gargantuan sized ego that really outweighs any contributions I can tell he has made outside of having a TV show. My guess is, a lot of women find that mammoth sized ego off-putting as hell. But like, is it really that hard for these guys to get dates from girls that aren’t work underlings?? I mean like, really?? And I’m also wondering, do they think “celebrity power” is going to let them “skate by” when they get creepers with 5+ different girls?? I mean, honestly I’m asking an open-ended question here. When roughly the 6th girl comes out, do they think the believability part comes into play there anywhere?? Menzie and his readership when they don’t have their professorship (in another life) they could work for the Washington Post or even the People’s Daily. Their fervent professionalism is entirely unbiased. Leave it to Urban Dictionary to give us choices on what your handle is really about! menzie your bias is showing. you cannot simultaneously hold that a) China’s threat not to buy US soy was always empty; b) China’s threat not to buy US soy had a significant market impact; and c) markets are at least somewhat forward-looking and reasonable. formereconomist: I can certainly hold these two views: (1) China will buy a lot less soybeans from the US than before, and at a lower price than pre-tariff, and (2) it will buy some soybeans from the US. I can also walk and chew gum at the same time, should I choose. Rational expectations is *not* the same as perfect foresight. I guess this is why you are a former economist. As winter approaches, we New Yorkers are loading up on rock salt. For the day job – I’ve been doing some research on transfer pricing for mining affiliates where I discovered some long standing battle between the IRS and the Canadian Revenue Agency regarding salt imported from Canada. I just hope that Wilbur Ross avoids getting on this bandwagon as rock salt is already too damn expensive. Shades of ZTE? Things may go more sideways.